The ripe fruits of perennial plant Terminalia chebula Retz. or T. chebula Retz. var. tomentella Kurt. , perennial herb of family Combretaceae. Yunnan, Guangdong, and Guangxi provinces in China. Collected in autumn and winter, dried. Slight in flavor, slightly sour and astringent, then sweet. Rich pulp, firm, brown-yellow peel. Unprocessed, or roasted. Pounded or remove the uncleus. Bitter, sour, astringent, neutral; lung and large intestine meridians entered. Astringe intestine to check diarrhea, astringe lung to check cough, relieve sore throat to produce sound. 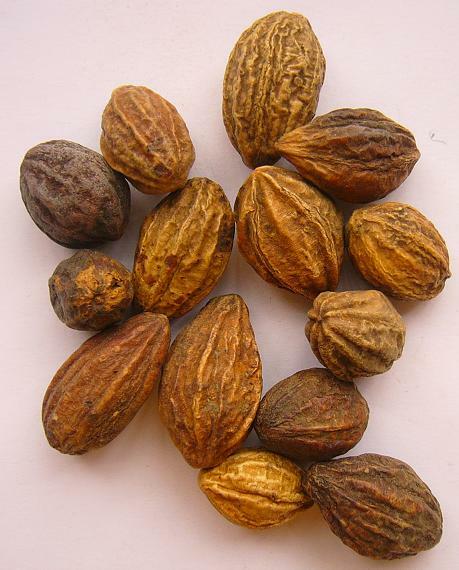 It is a common herb which is used for chronic diarrhea and dysentery, because it is astringent in flavor, large intestine meridian entered, and has action of astringing intestines to stop diarrhea. For chronic diarrhea and dysentery due to deficiency cold, it is combined with the middle-warming and astringing herbs. For instance, it is used with Gan Jiang, Ying Su Qiao and Chen Pi in the formula He Zi Pi Yin from Lan Shi Mi Cang. For long-term diarrhea and dysentery, it is combined with herbs of raising yang and tonifying qi, astringing intestines and lifting descending. For instance, it is used with Ren Shen, Huang Qi and Sheng Ma. It can both astringe lung to check cough and clear lung to relieve sore throat and produce sound because it is cool in nature, so it is an appropriate herb for aphonia. For chronic cough and aphonia, it is combined with lung-ventilating and sore-throat-relieving herbs. For instance, it is used with Jie Geng and Gan Cao in the formula He Zi Tang from Xuan Ming Lun Fang. For qi and yin deficiency, chronic cough and aphonia, it is combined with qi tonics and lung astringents. For instance, it is used with Ren Shen and Wu Wei Zi. For chronic cough, aphonia and sore throat, it is combined with heat and toxin-clearing and sore-throat-relieving herbs. For instance, it is used with Peng Sha, Qing Dai and Bing Pian in the formula Qing Yin Wan from Yi Xue Ting Zhi (Common Treatise on Medicine). Decoct 3~10 g. Raw material for astringing lung, clearing heat, relieving sore throat and producing sound, roasted for astringing intestines to check diarrhea.